Law enforcement officers face significant risk of injury and death from traffic incidents; it’s a serious occupational hazard; The leading cause of death for police are … traffic collisions — not shootings or other attacks, and very few of the collisions involve high-speed chases. Just run-of-the-mill crashes where inattentive or otherwise impaired drivers crash into them. Just how inattentive do you have to be to not be able to not notice an emergency vehicle with flashing lights? 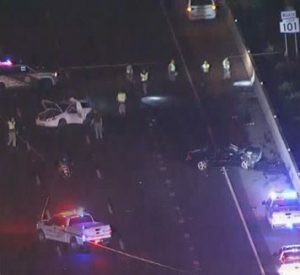 Apparently so much so that that driver will be charged with a crime, as Jorge Espinoza found out after killing DPS Officer Tim Huffman near Yuma in 2015. Espinoza was charged with 2nd Degree Murder, and convicted of Negligent Homicide and sentenced to 6 years in prison. Arizona continues to lack a statewide cell ban (see news about city of Glendale, below); but the problem with flagrantly bad driver incidents in general continues to be lack of investigation along with lack of prosecutorial will to pursue cases. The case of Officer Huffman is the exception that proves the rule. Perhaps the case of Officer Townsend will be too. The driver here was arrested on suspicion of a litany of charges, though that’s a long way from actually bringing charges, and longer still to any conviction. The message from the justice system in Arizona is clear: if you are drunk or chemically impaired and kill someone as a result, the hammer will come down hard. Otherwise, anything goes; unless you have the bad luck to kill a police officer. In related news, Glendale is the latest of a whole bunch of localities that instituted handheld cell restrictions. Can you say ‘patchwork’? At the same time, it’s not at all clear these sorts of restrictions are effective at dissuading drivers from engaging in dangerous behaviors. … Sanstead is facing charges including manslaughter in connection with the Tuesday night wreck that killed Officer Clayton Townsend. …While Townsend was standing at the driver’s side door of the white passenger vehicle he stopped, a black passenger vehicle entered the right-side emergency lane and collided with the white passenger vehicle and then hit the officer. …According to DPS, Sanstead told detectives he was texting when his vehicle struck the police officer. A witness told DPS that Sanstead’s vehicle crossed over two traffic lanes before hitting the officer. Sanstead, who has no previous record, was arrested and booked into jail for manslaughter, aggravated assault with a deadly weapon and endangerment. His attorney told a judge Sanstead is a licensed massage therapist and is married with children. He’s due back in court for a preliminary hearing on Jan. 17. There’s video of the initial appearance the defendant was released on $100,000 bond. Nothing showing in Maricopa County Superior court docket; not sure how that can be. Attorney Ann Groninger writes at bikelaw.com about a wrongful death lawsuit involving a distracted driver in North Carolina which resulted in the driver pleading guilty to misdemeanor death by motor vehicle, and ultimately a $4.5 Million jury verdict for wrongful death including punitive damages. The driver was doing it all in constant fashion for much of the time behind the wheel… texting, emailing, phoning, etc. The driver says the bicylclist swerved/drifted from the shoulder into the traffic lane, where he was unavoidably struck; no evidence supported that claim. In this case the police analyzed the driver’s phone and records; establishing a pattern. The driver also, according to Groninger had a very poor driving history; and these facts were not allowed to be introduces at the civil trial (not sure why). The civil case would be named something like Rotberg v. Rutledge ( ). What are the laws in Arizona that allow him to be charged? In Florida, killing someone while being distracted is not a criminal offense. Happens to cyclists all the time and the driver is not prosecuted. Are drivers who kill cyclists driving while distracted also charged, or is it just when cops are victims? I really don’t think that not bringing charges against drivers who kill cyclists is a cyclist thing; in other words, it doesn’t matter what mode of transportation the victim is using. There are plenty of motorist-victims where a driver is not charged, too. So, yes, I think the driver here being arrested stems from the status of the victim being an on-duty officer; though in the “eyes of the law” that’s not supposed to matter. “but the problem with these sorts of flagrantly bad driver incidents in general continues to be lack of investigation along with lack of prosecutorial will to pursue cases.” So true! How often have we seen reports of a pedestrian or bicyclist mowed down by a driver and the police can only think to report “speed was not a factor”? Not sure of the laws in Fla., but I think they are similar when it comes to manslaughter. We’ve had two deadly car on bike accidents recently. In one case a 92-year old woman mowed down four rides. Her family said they’d been trying to get her to give up driving. On the day of the accident, a state trooper said the cyclists were making an improper lane change, though he could not have possibly talked to them as they were all in the hospital. In another case, a woman admitted she was distracted trying to get something out of her glove compartment when she killed two cyclists. So far, no charges in either case. I have no proof, but I’ve heard enough stories to believe that cops routinely find fault with the cyclist rather than cite the driver.